Jon and I took Wizard out for a hike in the Assunpink. It was pretty hot and we were out for well over an hour. We walked through the back field behind the farm, around the Horse Park cross-country course, and up the road. Somewhere in the Horse Park, Wizard lost his left front shoe. I got him home safely, and his foot did not get badly shipped or shredded, thank goodness. On Friday, the farrier put a new set of shoes on him. We removed the leather rim pads and he welded a few dots of borium on his shoes for added traction and wear. Borium is sticky. Really sticky. Wizard was tripping a bit during our ride, and I could feel his feet “grabbing” the road more than I expected. I think I’ll skip the borium until perhaps the wintertime when ice is a risk. 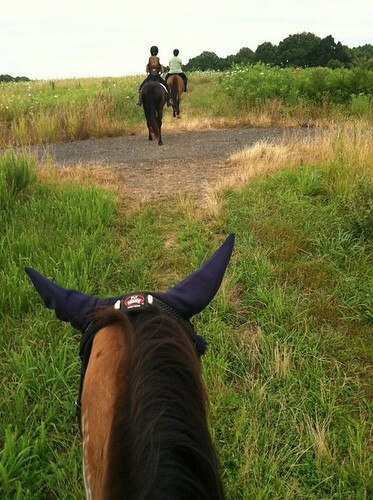 We rode out on the trails with Sunny and Brigid. We went out through the field by the log cabin, over the “bowling pin” hill, down into the “secret corn field”, and looped back around. We trotted the long side of one of the fields- it felt soooo nice to trot. My back is still cooperating, yahoo! We ended up on the road and walked back to the barn, where I did a teeny bit of ringwork with Wizard for the first time in MONTHS. We just trotted around and I asked for a few leg yields. He felt strong and willing. I quit before my herniated discs protested, cooled him out, and put him back in his paddock. Wizard and I took a brisk walk up the bowling pin hill and down the cinder road. I took him back to the barn for a good grooming. He developed a little bit of crud on his right hind cannon bone, so I am going to be more diligent about making sure he’s fully dry after I hose him off and before he goes out in his paddock.